It may not be OFFICIALLY summertime yet, but as far as our grill is concerned the season is in full swing. We’ve already grilled pizza, steak, burgers, and last week I pulled out the seafood grilling pan, cleaned it off and grilled us up some scallops wrapped in prosciutto, skewered not with regular old skewers. Nope, we skewered them with stalks of rosemary to give them even a little more summertime vibe. 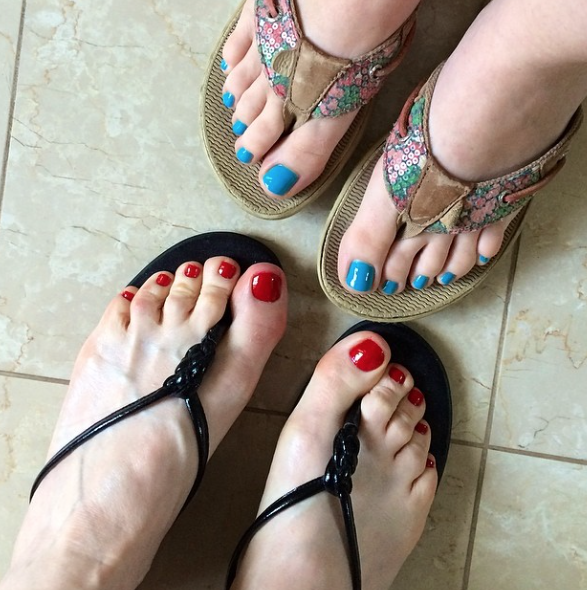 Because once we’ve gotten the first mother/daughter pedicure of the season, we declare summertime open for business. Guess whose toes are whose. Hint: whenever I get anything other than red on my nails, I instantly remember that the only color I ever like is red, and I continue to remember this for a few months until I go for something crazy like pink, at which point I instantly remember that the only color I ever like is red. Repeat. Anyway, this scallop recipe starts by wrapping large sea scallops in a folded thin piece of prosciutto. Ask for dry scallops at the fish counter of your supermarket. (Here’s the difference between wet and dry scallops from my friends at The Kitchn.) I usually estimate 4-5 scallops per person. Get the prosciutto at your deli counter – that way you can ask for exactly the number of pieces you need, it will be better than the kind in the package, and you can ask them to cut it Really Thin. 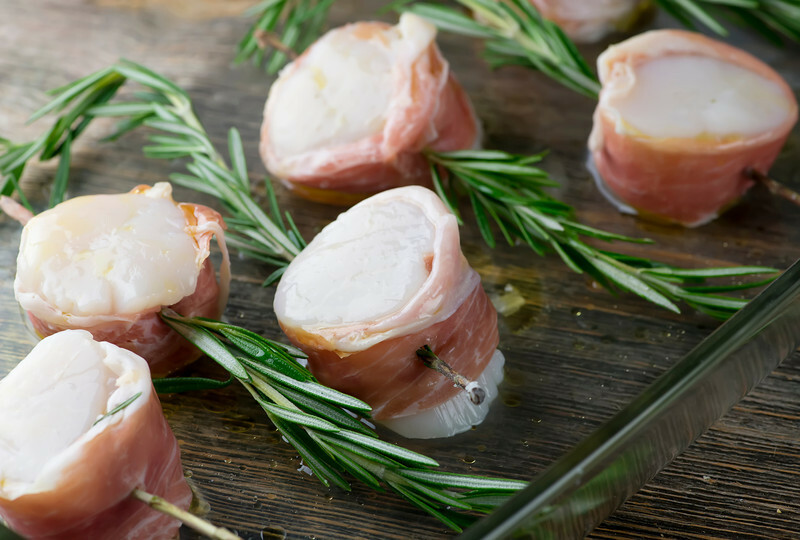 Now fold your prosciutto in half length-wise, wrap it around the scallop, and spear it with a stalk of rosemary – you’ll want to strip the leaves off the bottom couple of inches or so to have a nice clean skewer. Lay them in a baking dish and drizzle them with some olive oil, lemon juice and a little pepper. You can also scatter those rosemary leaves you stripped off on top. Let them sit for about 15-20 minutes. Now fire up your grill to high, and if you have a grilling pan, now is the time to use it. You can cook large scallops directly on the grill grates if they are big enough and you are super careful, but you do run the risk of one falling between the cracks, and that would be a tragedy. Anyway, cook ’em until they are golden on each side, about 2-3 minutes per side. Turn them with tongs – that’s the easiest way. The rosemary will be all nice and charred and crispy, and will have given your gorgeous scallops just a hint of rosemary wonderfulness. I like to put the scallops on the plates still on their skewers, because I am dramatic that way…or you can slide them off first for easier dining. These go wonderfully with rice, or you can be like us and just have the scallops. So as not to let anything else distract from the delectable scallop taste. Strip the bottom two inches of each rosemary stalk of leaves. 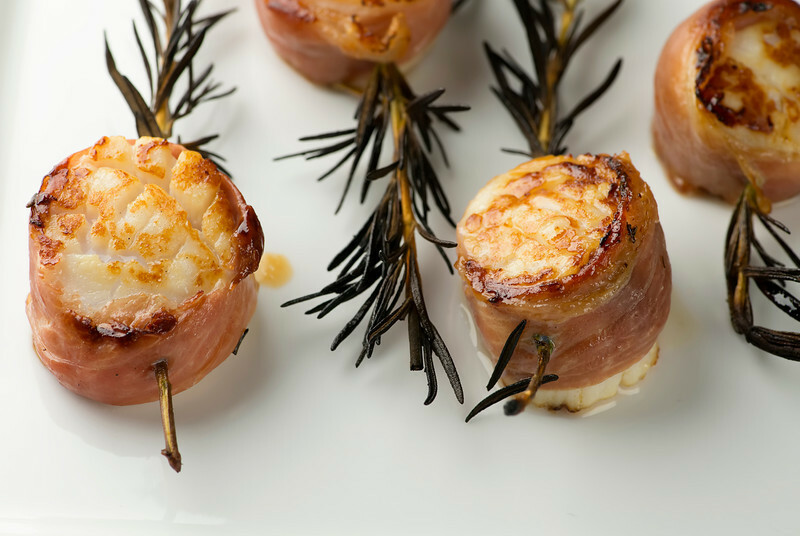 Fold each piece of prosciutto in half and wrap it around each scallop. Skewer with a rosemary stalk and lay in a baking dish. Drizzle with a little olive oil and fresh lemon juice and grind some pepper on top. Let marinate for about 15-20 minutes. Heat grill to high. 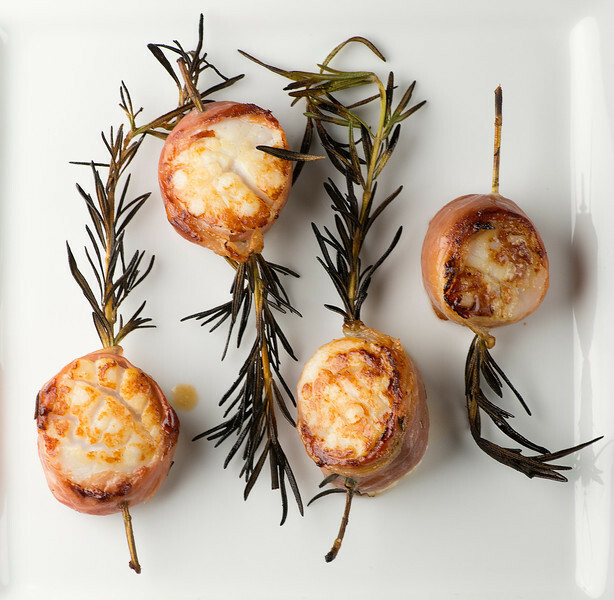 Using a grilling tray, cook the scallops for 2-3 minutes per side until golden, turning with long tongs. Serve at once! If you figure out that variation (and I’m sure you will!) let me know how it goes! Another winner Kate. I made these simple and ez scallops last night as an appetizer. $20 Weber grill pan a must in my opinion. A tip for others: Watch the scallop to prosciutto ratio. I bought pre-sliced/packaged prosciutto to make the prep even easier, but I believe it was too thick and a bit over powering. Have it sliced thin as Kate suggested and then cut to size and taste for your scallops and palate. Definitely great advice on the prosciutto – you definitely don’t want it to take over the taste of the scallops. Thanks, Steve!